School is out and summer is in full swing, but for seven aspiring artists, classes are just beginning! 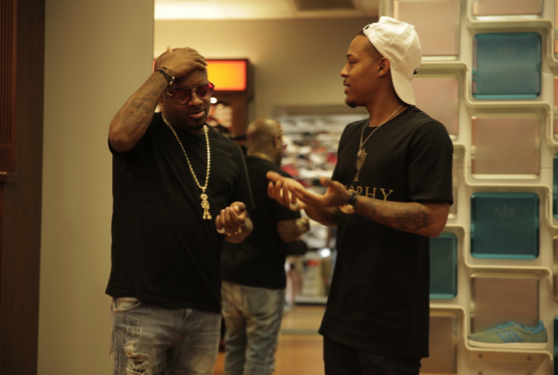 Learning from the best in the music industry, these young rappers have the opportunity to work with Grammy winner and producer Jermaine Dupri in an all-new season of The Rap Game (#TheRapGame), premiering on Friday, July 22, at 10pm ET/PT. To help mentor the young teens throughout the season, Dupri enlists the support from some of the most successful artists in the music industry including iconic singer Mariah Carey and legendary rappers Snoop Dogg, Timbaland, Nelly, Bow Wow, Monica, DaBrat, Flo Rida and producers, Bryan-Michael Cox, Zaytoven and Mike Kalombo. The winner will receive a recording contract with Dupri’s label, So So Def Recordings. Grammy and Emmy award winner Queen Latifah and her partner Shakim Compere are executive producers under the Flavor Unit umbrella, alongside Mechelle Collins and Kevin Dill of Intuitive Entertainment and Dupri. The first season finale of The Rap Game ended with series highs across all demos including 2.2 million Total Viewers (a +69% jump) based on L+7. The series propelled Lifetime to be the number one cable network among Women 18-49 and Women 25-54 in its Friday 10-11pm time period. Jayla Marie, 12, Raleigh, NC – Jayla Marie first caught the attention rapper Nas who shared her YouTube video, “If I Ruled the World.” With the support of her momager, Jayla believes that she is the complete package and her hardwork will lead her to be the next big thing. J.I. aka The Prince of New York, 14, Brooklyn, NY – With three years of rapping under his belt, J.I. brings a level of lyrical genius that’s on par with some of the biggest names in the industry. Influenced by Tupac and Nas, what The Prince of NY lacks in experience, he makes up for in impressive freestyles and a unique flow. Lil’ Key, 15, Baltimore, MD – Lil’ Key started rapping at ten years old when he performed a gospel rap in a church talent show. An avid writer, Lil’ Key writes his own music and is focused on finding a unique sound to stand out from his peers with his parents by his side. Mani, 15, South Central LA, CA – Mani started spending time in the studio when he was six years old and released his first mixtape at twelve. He recently dropped his single, “I’m the Best,” and has been making music with DJ Battlecat and Tha Dogg Pound, as well as opening for Mindless Behavior. Managing Mani’s career is a family affair with his mom focusing on the business side of matters and his dad overseeing all things creative. Mini Barbie, 12, Atlanta, GA – At the age of two, Mini Barbie impressed her mom by singing Beyonce’s “Irreplaceable” verbatim and since then, has performed all over Atlanta. A fashion trendsetter with devoted fans, she idolizes Nicki Minaj and wants to be the last rapper standing. Nia Kay, 14, Chicago, IL – Nia Kay began rapping at the age of eight and made her first music video by the time she was ten. With the encouragement from her parents, she uses rap as a platform to express herself, always pushing to be better and work harder. Inspired by Lil’ Wayne and Nicki Minaj, working alongside Jermaine would mean everything for Nia Kay. Tally, 16, Nashville, TN – Tally discovered her rapping abilities accidentally, rapping the hook to a song her sister was singing. The discovery led her dad to recording her rapping in their home studio. While acting was Tally’s first passion, rapping has now taken over in hopes she can show other girls that regardless of their ethnicity or background, they too can rap. Produced by Intuitive Entertainment, The Rap Game is executive produced Kevin Dill and Mechelle Collins (The Millionaire Matchmaker, Atlanta Plastic), Ted Iredell (Making the Band), Perry Dance (Making the Band) and co-executive produced by Adam Schor (The Biggest Loser). Lifetime’s Mary Donahue and Mariana Flynn also executive produce in addition to Dupri, Latifah and Compere. Filmed in Atlanta, ten episodes have been ordered for this season.